The Scottish Government has announced £4m of investment to tackle period poverty. Period poverty: Minister hopes to reduce stigma (file pic). 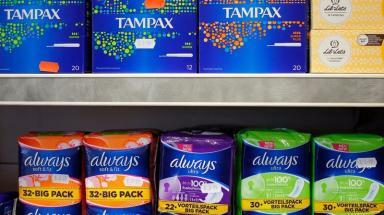 Free sanitary products will be available from more locations after a £4m investment from the Scottish Government. The money is being made available to Scottish councils who will work in partnership with other organisations to tackle period poverty. It means sanitary products will be available in public buildings such as libraries and leisure centres, with funding available now and for the next financial year. The move follows the roll-out of a scheme offering free sanitary products in Scotland's schools, colleges and universities last August. Communities secretary Aileen Campbell announced the funding on a visit to Move On in Glasgow, a FareShare food centre which distributes sanitary products to people on low incomes. Ms Campbell was told by staff of one woman who used the £7 a month she saved from being able to access free sanitary products to pay for extra football training for her son. "This is about breaking down barriers and enabling women to access sanitary products, which are not a luxury product, they are a necessity for a very large part of a woman's life, and so to enable them to access that freely because of their own financial challenges is something that I think is important and is supporting women." Last May the Scottish Government gave FareShare £500,000 to expand access to sanitary products through its network of third sector partners, following a successful pilot in Aberdeen. "It's demeaning and it stops them from doing things, and for younger kids they don't want to go to school and it has a knock-on effect. "Having it in schools will have a massive impact, and it's taking the stigma away from it, the idea that it's dirty or that you don't talk about it."